The last post loosely took the E.M.Forster quotation ‘only connect’ and asked if this might be at the basis of some of the creative process — can originality be fostered by stuffing your subconscious full of stimulating ideas and experiences which could stew away unsupervised like a warming winter casserole or, alternatively, blast into each other like a psychological Hadron collider. Bearing this out, I’ve realised there’s a loosely recurring theme of odd and unusual connections in many of the experiences I’ve enjoyed or places I’ve visited over the past few months — locations which are on the margins between conflicted forces or genres where conventionally opposing styles or materials have been placed in opposition. Shoreditch is the classic example of an area that has been transformed by the influence of artists, with the Village Underground tube train carriages providing a landmark juxtaposition. 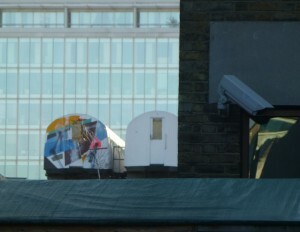 It’s arguable that Shoreditch has become so ironically commercialised that it’s developing into a caricature of itself. For several years, artists have been priced out of the area (as is Kim in my novel), not just by the geek-cool spillover from David Cameron’s beloved ‘Tech City’ in Old Street but by speculative apartment-buying business types (even more beloved of Cameron). 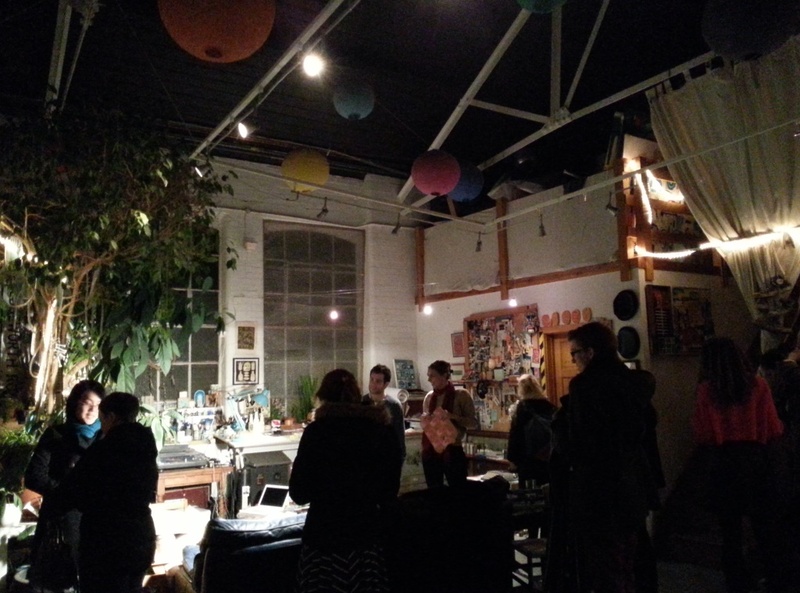 The warehouse-squatting, loft-dwelling artists have been dispersed to Peckham (mentioned in Time Out virtually every week), Hackney Wick (whose artists ‘took over’ the V&A at the end of February) and rather bizarrely, as I discovered a few weeks ago, to suburbs like High Barnet. I climbed four storeys up an external fire-escape with my friends from Love Art London way out in the hipster-there-be-dragons territory of zone 6 to visit the artist, David Shillinglaw. He was a thoroughly generous and entertaining host, welcoming us into his loft studio which was located in an old false-teeth making factory (if it was in a novel this detail would seem way too far-fetched!). The studio was an amazing jumble of finished artworks, pieces in progress, plants (the tree apparently belonged once to Bob Hoskins! ), huge rubber balls, artists materials and cats plus everyday objects (I think he lived there too — David Shillinglaw, not Bob Hoskins). While the artists move to the likes of Stoke Newington, Deptford and, er, High Barnet, property developers haven’t been slow to make the connection between exploiting the lingering aura of edgy cool and the large plots of under-exploited land in Shoreditch. Schemes that have been approved are in the pipeline that will transform the area irreparably: a 40 storey tower is to be built almost opposite Village Underground with a new shopping centre on the other side. 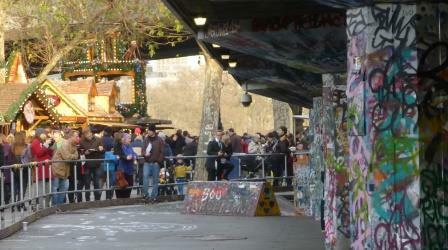 Speaking of developers trying to muscle-in (and, in so doing, destroy) on ‘cool’, ‘gritty’ urban locations, I took the photograph below just before Christmas of one of the most bizarre connections in London — the South Bank’s Bavarian Christmas market set opposite the graffiti-plastered undercroft of the Queen Elizabeth Hall, adopted as London’s skateboarders’ spiritual home. Drinking steaming glühwein while watching skateboard jumps in a reclaimed space of brutalist architecture is the type of accidentally cosmopolitan experience only London can offer. Unlike some of the most favoured spots for Shoreditch street artists, the undercroft has been reprieved from development into shops. There are a quite a few posts on this blog that mention street art: in the novel Kim brings her graffiti artist skills to places that haven’t traditionally welcomed them. Perhaps its appeal is partly because of another unusual combination — the traditionally reverential and formal world of fine art and the constantly changing, chaotic, almost anarchic urban spaces that foster street art culture. My friend Sabina Andron, who runs the I Know What I Like Meetup Group in London, is studying street art for a PhD at University College, London. Over a period of 100 days last year she conducted an intriguing initiative, photographing the same stretches of wall on Leake Street (a virtual tunnel underneath Waterloo station) every day over a month and recording the organic, rapid changes in the artwork. Sabina won the UCL Graduate School research poster competition for a poster featuring 100 images of one wall. Her website has a page which has time-lapse animations of all the walls. Its well worth viewing and may change your view of street art if you’re sceptical of its artistic value. Writing, art and geography are, of course, not the only areas in which ‘only connect’ produces exciting and unusual innovations. Musicians often cross-fertilise, with many whole new genres created from the fusion of apparently unrelated styles. 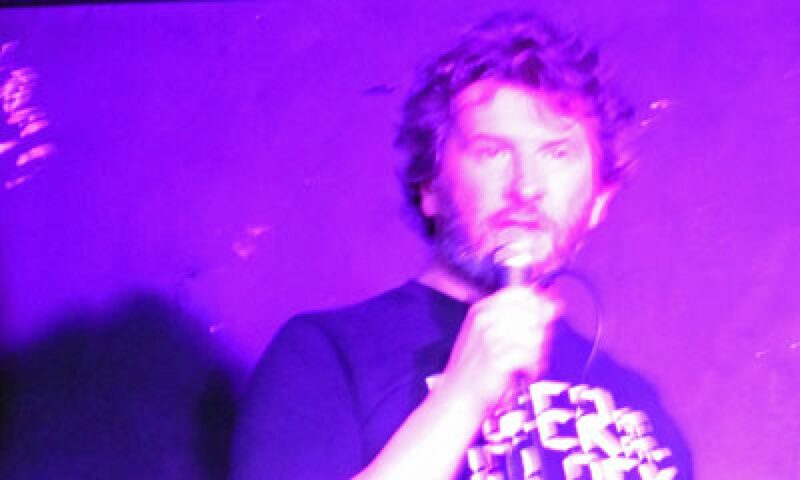 In my local pub the recent English graduate cellarman often exposes the village regulars to his eclectic musical tastes, gained from working at music festivals across Europe. It’s a bizarre experience to walk into a rural English pub and hear dub reggae by the likes of King Tubby flowing from the speakers. I was having a drink in the pub recently and began to recognise a song I knew very well but was also simultaneously unfamiliar. I worked out it was a track from Dark Side of the Moon. The skanky,offbeat rhythms meant it definitely wasn’t Pink Floyd but it was surprisingly good — like any good, radical cover version, making the song sound written as if it was specifically for the other genre. The track was Time and the album was the brilliant Dub Side of the Moon (see above) by the Easy All Stars. I bought it straight away and now listen to it interchangeably with the Pink Floyd original. And foodies can give musicians a run for their money in terms of matching up bizarre combinations. Food is a major feature of the novel (including the odd matches inspired by the likes of Heston Blumenthal — liquorice ice-cream, snail porridge, mango and douglas-fir puree and the rest). So, wanting to see something of the cutting edge for myself, at the end of last year I visited the Experimental Food Society Spectacular at the Truman Brewery in Brick Lane. This was an event run by people who like to do weird things with food. Some exhibits were immersive experiences — exploring how story-telling could influence flavours or how different senses interacted with each other. Some were just a bit, well, bonkers. 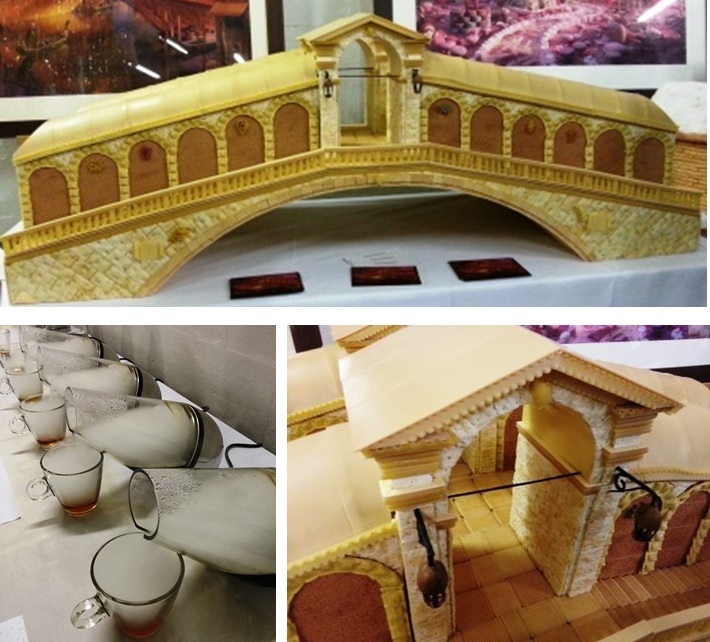 Let’s connect Italian food with an Italian evocation of place by building a model of Rialto Bridge in Venice purely out of dried pasta and crackers (it can be done — see below — although I’m not sure whether an arrabbiata or puttanesca sauce would go best with the balustrades or portico). Experimental Food — Top and bottom right: The Rialto Bridge made of pasta and crackers; Bottom left: Vapourised tea. I’m not sure my fictional pub will go as far as serving its drinks in gaseous form, however intriguing the idea. 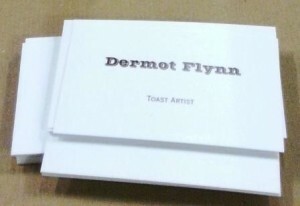 But with an artist on the premises it could offer something for breakfast similar to the work of another Experimental Food Spectacular exhibitor — Dermot Flynn — Toast Artist. A little like a street artist, Dermot Flynn, connects art with unusual surfaces — in his case toast (a look at his website shows that he works by no means exclusively in toast but it’s one of the more unusual way he earns a crust). Love it or hate it, the genre of edible art means it’s unpalatable to use conventional paint, so he uses Marmite instead. 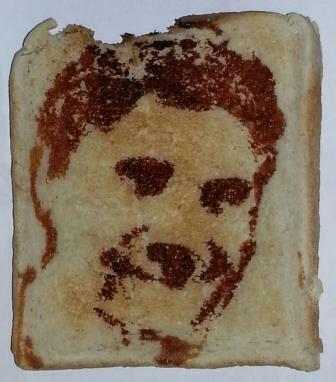 Apparently if the Marmite is applied to white bread (presumably the more manufactured and sterile the better) to create an image which is subsequently put into a toaster, the desiccation process means the picture (or toast) will last for an indefinite period. If you can resist eating your artwork, Dermot told me that it’s perfectly possible to frame it. For £10, I couldn’t resist the offer of having my portrait created in this unusual medium but I’ve taken the precaution of photographing it in case of unexpected nibbling. Love Me or Hate Me?